Swedish researchers have discovered that the anti-anxiety drug oxazepam is having a noticeable effect on the behavior of aquatic life. Traces of this popular pharmaceutical get flushed into rivers and other waterways where they remain biochemically active. But until this new study, it wasn't known if these chemicals had an effect on the behavior of aquatic life. As the research now shows, the drugs have a similar effect on fish as it does on humans, causing them to become bolder, less social, and more prone to over-eating — changes that could have longterm ecological impacts on fish populations. Researcher Tomas Brodin and his colleagues reached this conclusion after conducting an experiment that mimicked the concentrations of oxazepam found in the wild. They did so by adding trace concentrations to aquariums that matched levels now found in local rivers — about a microgram per kilogram of fish body weight. They then looked for any changes in behavior to the fish — European perch in particular. "[Fish] exposed to water with dilute drug concentrations...exhibited increased activity, reduced sociality, and higher feeding rate," they noted in the study. "As such, our results show that anxiolytic drugs in surface waters alter animal behaviors that are known to have ecological and evolutionary consequences." 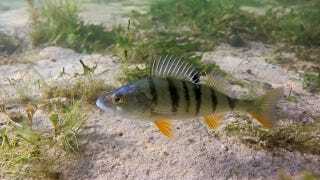 Perch are normally shy and hunt in schools — a strategy for survival and growth. The change in behavior could have detrimental consequences as they're likely now less adapted to their environment. The solution, says Brodin, is not to stop medicating people, but to improve sewage treatment plants to capture the drugs and reduce their contamination of water systems in the wild. The study, which was was conducted by scientists at Umeå University in Sweden, has been published in Science.